Castlegate Home Improvements has been operating in Perth for 20 years. Thats a long time building decking, patios, verandas, fencing and roofing. Last year, Castlegate Home Improvements decided we needed to pull our little family run business into the 21st century and give ourselves a modern look. Don’t get me wrong, we still retain our old fashioned values of personal service, professional advice and elbow to the wheel work ethic but we now have a spring in our step and we feel we have just as much, if not more to offer than our larger company competitors. Well, I can tell you a little story. 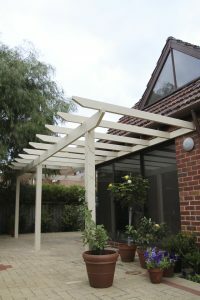 We built a pergola for an older lady recently. She has a home in Mount Hawthorn where she’s lived for over 60 years. She wanted a pergola to cover her pot plants. 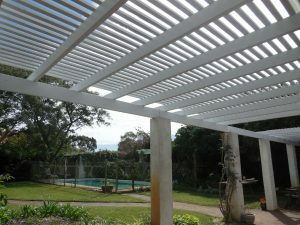 It had to be painted Mission Brown to match a pergola we’d built her a few years earlier. We completed the job just as she asked and in an efficient manner. When I dropped the invoice to our client a few days later (she didn’t have email), she answered the door telling me to leave the invoice on the doorstep because she had the flu. Being concerned for her, I went to the local shop and bought a few lemons and a pot of honey and went back to her house to drop them off with a little note wishing her a fast recovery. Our elderly client was very touched that we cared for her but really, I didn’t do it to win points, I just saw she needed something and I could help. So, we may not provide all our clients with lemons and honey but we do listen to what is needed and wanted and we go out of our way to provide it. That takes me back to what I was saying. We have updated our logo. It was designed by Lara of Billie Hardy Artistic Design and it represents improvement and enhancement of your home. We designed our website ourselves because we are the ones who know what we do best. Thank you for supporting small local business. We enjoy helping our clients to feel comfortable with having a tradesman at their home and we love being part of your home’s transformation, even if all you need right now is a new down pipe! If you are looking for honest, good old fashioned service, then Castlegate are your team.